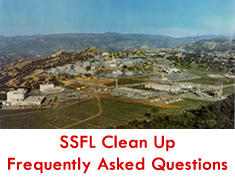 Community organizations working for the long-promised full cleanup of the Santa Susana Field Laboratory (SSFL) have launched a new campaign to bring attention to the Boeing Company’s unscrupulous efforts to walk away from cleaning up most of its nuclear and chemical contamination at SSFL by claiming it wants to “protect” the polluted site. The groups also decry the state toxic department’s newly released draft Environmental Impact Report (EIR) for breaking the agency’s previous commitments to a full cleanup. “Protect Santa Susana from Boeing,” a new website launched today by cleanup advocates, reveals Boeing’s underhanded efforts to get out of cleaning up its SSFL contamination. It counters Boeing’s new propaganda site “Protect Santa Susana,” which lobbies to “protect” Santa Susana from being cleaned up, not protect it from the radioactive and toxic chemical contamination for which Boeing is responsible. Boeing began this PR push in 2012, when it hired a firm to created a secret media campaign to “shift discussions from a site with a sordid past to one with potential.” In April 2017, as the Department of Toxic Substances Control (DTSC) was nearing release of its EIR for SSFL, Boeing ramped up the effort with the release of its website which urges people to submit public comments to DTSC and elected officials to let Boeing off the hook for cleaning up the great majority of its radioactive and hazardous chemical contamination. In 2010, DTSC committed that Boeing would have to clean up all of its contamination. And for years, Boeing promised a cleanup to at least suburban residential standards to provide assurance for the people who live nearby. But Boeing has now broken that commitment; its website argues that SSFL should only have to cleanup to recreational standards. Recreation standards are extremely weak, as they are based upon people being on the site infrequently. But people live near SSFL 24/7, and if most of the contamination is left behind, it will continue to migrate offsite and threaten their health. Boeing’s own risk assessment reports show that the contamination is so high in some parts of the property that if people were to live on it, 96% of them would get a cancer from the contamination. Even with some dilution in migrating offsite, the risk would remain high for people living nearby. Ironically, Boeing’s own reports also indicate that the levels of contamination it wants to leave behind pose serious risks to the very wildlife it claims it wants to protect by getting out of its cleanup obligations. Community members are also outraged that DTSC’s draft EIR breaches the commitments it had made to require a full cleanup. The EIR includes proposals that would violate the cleanup agreements it signed with DOE and NASA. Those agreements bar consideration of “leave in place” alternatives, yet DTSC now proposes to leave in place vast amounts of contamination. And for Boeing’s part of SSFL, the EIR blocks from even being considered cleanup to the standards DTSC had long promised. Instead, it says the best that would be done would be cleanup standards nearly thirty times less protective than DTSC’s own official residential cleanup levels, and far less than the promised cleanup to agricultural/rural residential and background standards. That leaves an EIR with a thousand pages of all the supposed negative impacts of doing a cleanup, but nothing on the negative impacts of the contamination and the health and environmental harm that would occur if the pollution weren’t cleaned up. By omitting cancer risk information and hyping potential negative impacts of the cleanup, the EIR presents a biased and inaccurate assessment of the SSFL cleanup. It is essentially a PR attack on the cleanup commitments DTSC itself had made.